The Midwest Popular Culture/American Culture Association has held annual meetings throughout the Midwest for over 30 years. The conference generally attracts 350 registered attendees (each receiving a copy of the Program). Subject Areas are many and our conference attendees are scholars, teachers, professionals, and enthusiasts, representing a variety of fields in cultural studies: education, business, entertainment, fashion, gender, ethnography, technology, popular science, history, fiction and non-fiction writing, philosophy, and many more. Admission to the conference is free to our exhibitors. We ask to receive the names of those helping with the display in advance of the conference date so that we can have nametags already printed for them. We also have several options to advertise to our members. You may purchase full or half page ads in our print program. 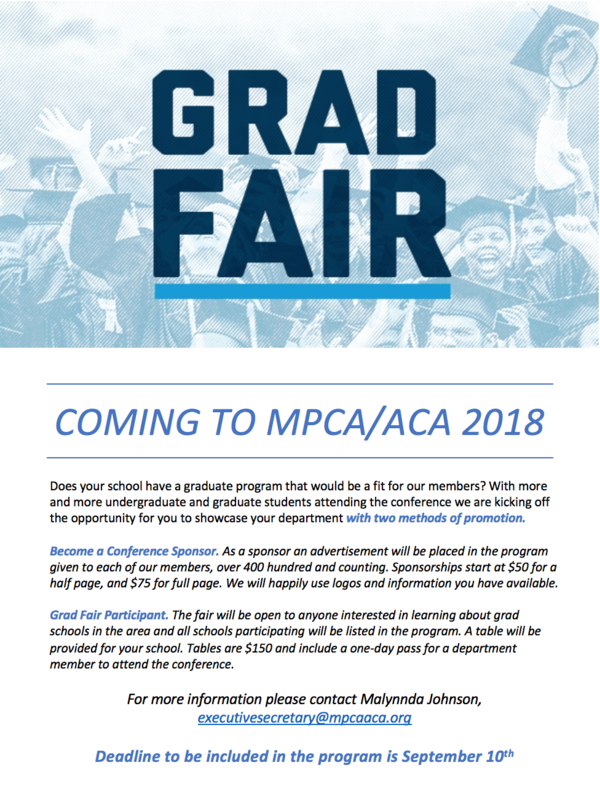 For the first time, MPCA/ACA will have a digital program for participants. You may purchase a banner ad. Have a graduate department you would like to showcase?? Please contact our Executive Secretary at executivesecretary@mpcaaca.org for any questions.